Welcome to the studio! At Toni Elmer Photography we truly believe that “to have photographs is to live life twice…” and I am so grateful I get to wake up every day and help so many amazing families have the opportunity to relive some of life’s most fleeting moments. Your space says a lot about you. It gives your clients a feel of what they’re going to get. If it’s a warm and inviting space they’re going to feel like it was a more personal experience. If it’s a stark and harsh feel they’ll feel a disconnect. 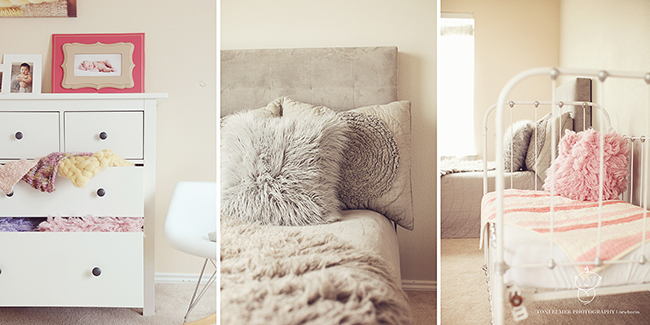 For me, warm and inviting isn’t hard to achieve since my studio is in my home. So when a client comes over, I make sure they feel like they’re right at home. I’ve got cold bottles of water ready, snacks, and candy if they feel an itch to satisfy their sweet tooth! Not to mention a bed in the room just in case they decide they want to take a nap, which every new mom deserves whenever she can get it! I should know, I’ve had 5 kids… been there, done that… I know the definition of sleep deprived! Ha ha! I mainly shoot newborns thru one year. 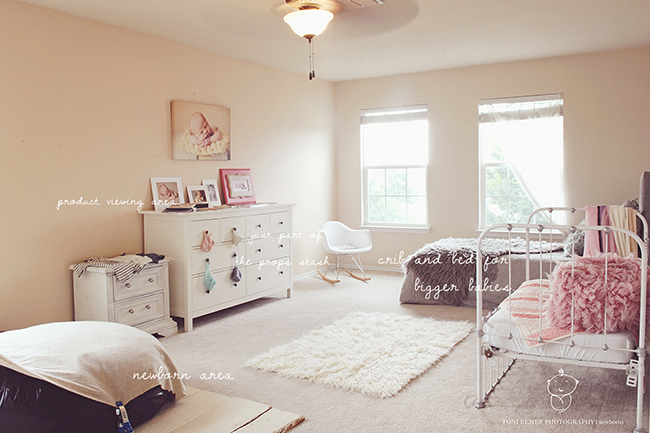 So, when I designed my space, I wanted it to feel light and airy. I wanted it to feel happy and clean – and I think I’ve achieved that! I definitely still have some ideas of other things I want to do, but it’s a work in progress. And I’m ok with that! I have a few different areas in my studio space. I have a corner dedicated to where I shoot my newborns. The light in that corner is divine! It’s great even on a cloudy day! 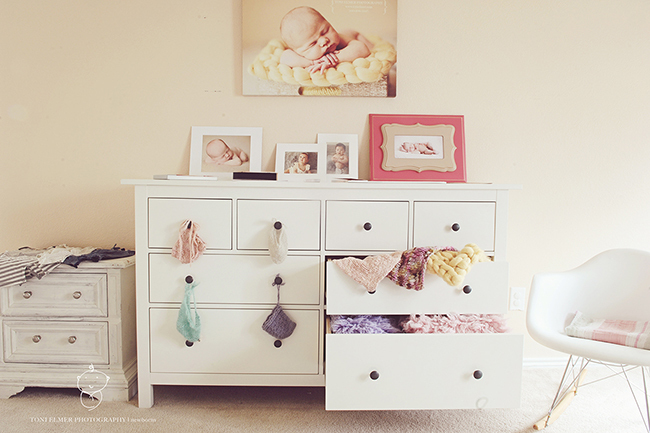 Then, I have an area for bigger babies that includes a vintage crib and a bed that I use for my Simply Baby Sessions. Lastly, I have a sitting and product viewing area. 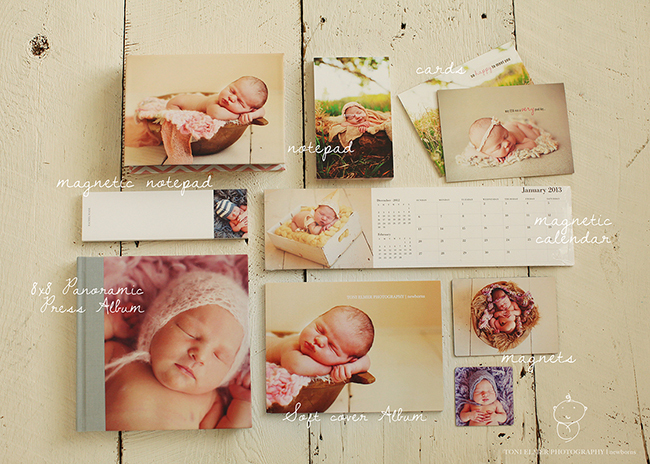 My moms and dads love to view all my products while we’re taking pictures of their sweet little one. They’ll pop over and peek at their baby, probably snap a pic with their phone to post on facebook and gush over their sweet new little one, and then head back to the waiting area where they view all the fun products that we offer! Thanks to Toni for sharing her studio space with Pinhole Pro. If you would like to share your studio space, please email us at marketing@pinholepro.com.